Students study the geography of ancient China by reading some engaging facts. Then, they explore its geographical features, such as rivers, mountains, deserts, climate, and population. Next, they describe and explain the natural barriers that kept China isolated for centuries. Finally, they learn about the Great Wall of China in text and visuals, and they write a paragraph about the wall from the point of view of an ancient guard there. In this experience, students study the geography of ancient China by reading some engaging facts. Then, they explore its geographical features, such as rivers, mountains, deserts, climate, and population. Next, they describe and explain the natural barriers that kept China isolated for centuries. Finally, they learn about the Great Wall of China in text and visuals, and they write a paragraph about the wall from the point of view of an ancient guard there. 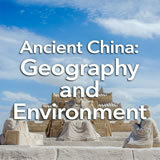 Locate and describe the physical geography of ancient Chinese civilization. Identify the ways that geography influenced ancient Chinese civilization. China has more people than any other country on Earth, and it has one of the longest histories. In this experience, you’ll learn about its geography. Some people both in and out of China spend their lifetimes studying that remarkable country and its past. To glimpse just a few of the most important facts about China’s geography, read Amazing Facts about Geography of China. While you’re there, look at the globe map to see China’s location. Write one fact about China’s geography that you remember without looking back at the article. Why does that fact interest you? Encourage students to give their overall impressions of China after they share specific facts.